This is some pictures of my motorbike Kawasaki KZ200 as known as Binter Merzy where I bought it about years ago. You can see the metamorphosis of it. Add some cheap component I've bought from secondhand market. No need to spend much money to restore it. I love this bike, and I don't want to lose it! This style inspired by Harley Davidson WLA 1942. 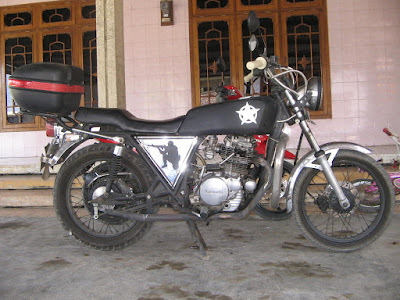 And this one I adopted from Police Motorcycle. Applying some accessories like engine guard, passenger footsteps and replace the original handlebar with custom pipe. I don't know what kind of style on my next project. Just wait...! 2 Tanggapan untuk "It's My Bike! (Kawasaki KZ200 - 1982)"